THE CHEESEBURGERS HAD an epic gig Saturday night at Red Light. It was packed all night and the sound was good, and we had a couple of guest appearances that made it really fun. It did not start out well. We were told to not set up until after 7 p.m. for our 9 p.m. show. Normally we like to get there in the afternoon to take our time and work out any sound kinks and setup issues. But when we showed up Saturday night, the place was packed. You couldn't even move inside the restaurant/bar area. And there were three tables by the "stage," which is just a spot on the floor by the bar. Waiting it out with roadie and light guy Issac. I hate stages, so that part was good. But waiting until people finished eating on a super busy night was a challenge. Fortunately the patrons were super cool about it and we managed to move some tables back, but we couldn't finish setup until after 8:30. The owners and staff were apologetic, but what are you going to do? It's not a bad thing to be super swamped all night. Some bands freak out when facing challenges. Not us. We've seen it all. We did what we could and waited it out. We finally squeezed it all together and started a few minutes after 9. It. Was. AWESOME. One of our best gigs ever. People were into it and even by midnight there was still a great crowd. 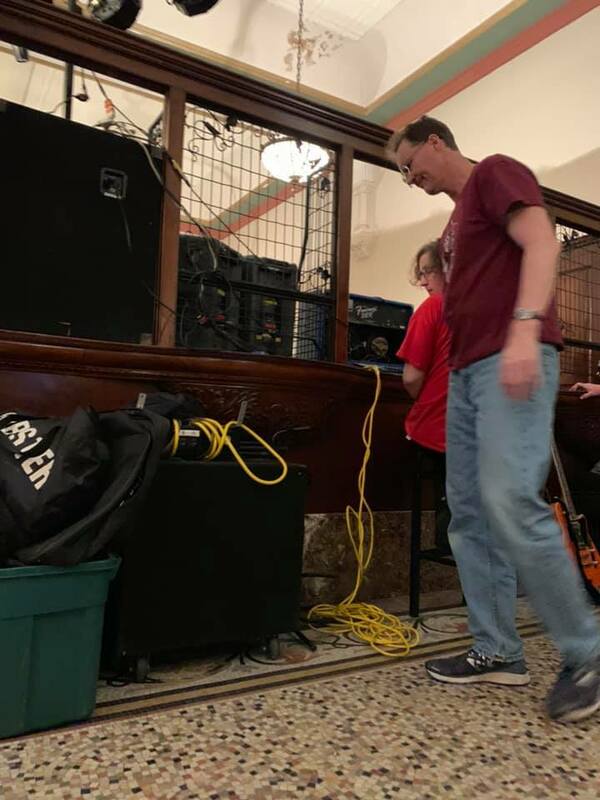 We were nervous because it's a massive room with a high ceiling, but Kirk dialed in our sound and we didn't mic any of the guitar amps, and it worked. We lost our floor monitors in the second hour and never did get them back, but I personally can never hear much on stage anyway - you just learn to adapt and figure it out the best you can. Skeeter Whitaker came up and jammed on a song with us and sounded phenomenal, and Cori Lyssy sang a few songs with us and did her usual great job. There was a gal from Australia in the crowd who loved it and sent back photos of us Down Under. So now we have Cheese in the Outback! Thanks again to everybody who came out. Every gig has a story or stories, and all in all it was a great night.